Sometimes, when a service club needs a speaker for its weekly meeting and a non-profit needs a champion, serendipity happens. This occurred recently when a new member of the Rotary Club of Sisters was completing a list of new-member tasks. One of those was to find a speaker for a meeting. The member, Gayla Nelson, knew that Sandy Affonso had recently founded a nonprofit called A Home to Share, through which she is creating a home and community for young adults with special needs. Affonso's daughter, Lizzie, has Down Syndrome and is well-known and loved in Sisters. Nelson arranged for Affonso to share her vision with the Rotary Club. After the presentation, the Rotary president said, "I think we can help." The members agreed, and on Saturday a crew of Rotarians, A Home to Share board members, and community helpers completed the first phase of an exterior refurbishment of the house, located on Spruce Street in Sisters. 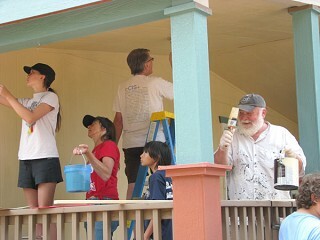 The volunteers painted the exterior and added battens and decorative shutters. The next phase is constructing a deck to connect A Home To Share with the Affonso home. Landscaping and interior work remains and will be done by others, making A Home to Share a collaborative effort. It's just this sort of effort that Affonso was seeking when she and her board began the process of bringing the vision to life. The concept of A Home to Share is different from other residential homes available to young adults with disabilities. It encourages independence, with the residents receiving support through their individual service providers. Each resident will undergo a functional assessment to determine an individual service plan. Life skills and employment opportunities are covered by the plans. Parents whose adult children have disabilities are at some stage faced with the fact that one day they won't be able to care for their children, said Affonso. "This is a project about living (as family) in a community and seeing that community invested in it. When I'm gone, it'll continue," she said. She admits she didn't really expect a service club to step up to help. She thought it would be a more in-house project, but she was happy to accept the help from Rotary. "There's a palpable energy here today," she said. "It's optimistic, and fun, a celebration." The Rotarians agreed. Hal Darcey, who is a long-time Rotarian but new to the Sisters club, took on the task of overseeing the project. Darcey, a retired contractor, said, "We need to use our professional skills to do the work of Rotary, and I'm delighted to use that with this project." He moved quietly among the volunteers, encouraging and instructing where needed. No one was left standing around, unless they were taking a break at the food table, where much good-natured ribbing occurred. Diane Ross brought her two children to help with the painting. They carefully finished up detailed trim work, learning a skill and being part of a group effort. "When you do a project like this, you see a community come together, for the benefit of others. And there's something to be said for that," said Ross. Francie Kibby her husband Hal, and Jim Barnes have been involved in many hands-on projects. Francie commented that the viability of A Home to Share "shows our community cares about every individual," while Barnes liked the finite aspect of a project that is visible. Steve Auerbach concurred that the project will have a lasting effect in Sisters and felt that it is one of the best things the Sisters Rotary club has done in several years. For Nelson, having club members act on the Rotary motto "Service Above Self" for her dear friends Sandy and Lizzie is a delight. "This is such a worthwhile and happy project," she said. For more information on A Home to Share, visit www.ahometoshare.com. For more information on Rotary Club of Sisters, call 541-350-3085, or visit www.sistersrotary.org.